Alistair GRANT grew up in the small fishing port of Etaples, his mother's home town in North-East Normandy, where he kept an house throughout his life. Etaples is the key to his identity, both as a person and as a painter. Grant's father was half-French and half-Scottish. Allhough he was born in West Kensington on 3rd june 1925, Grant was always more at home in France and only learnt to speak English at school, which he was happy to leave aged 13. For a short while he worked in a combined solicitors and estate agents office, and nurtured ambitions to become a vet. Then, deciding that art students were for better-looking, he went lo study at Birmingham College of Art(1941-43).It was a traditional enough education,with much emphasis placed on still-life drawing. After serving in Egypt with the RAF during the war, Grant returned to art school and the Royal College, where he was taught by the likes of Corel Weight and Ruskin Spear. 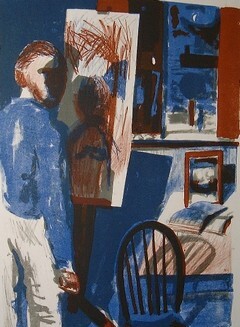 Attracted to printmaking, he studied lithography with Edwin la Dell and etching with Robert Austin. Hee was to remain closely associated with printmaking all his life. Grant became a great and justly-revered experimental printmaker. He was to work in the printmaking department of the Royal College for 35 years (1955-90), acting as Head of Department 1970-90 and as Professor of Printmaking (Emeritus} 1984.90. To many he is known only as a printmaker, but he always thought of himself as a painter first and foremost. 1955-1970 Tutor in Printmaking Department,R.C.A. 1970 Head of Printmaking Department,R.C.A. 1984 Chair Printmaking Department, R.C.A.